Who ever knew "brownies" could be so fresh? 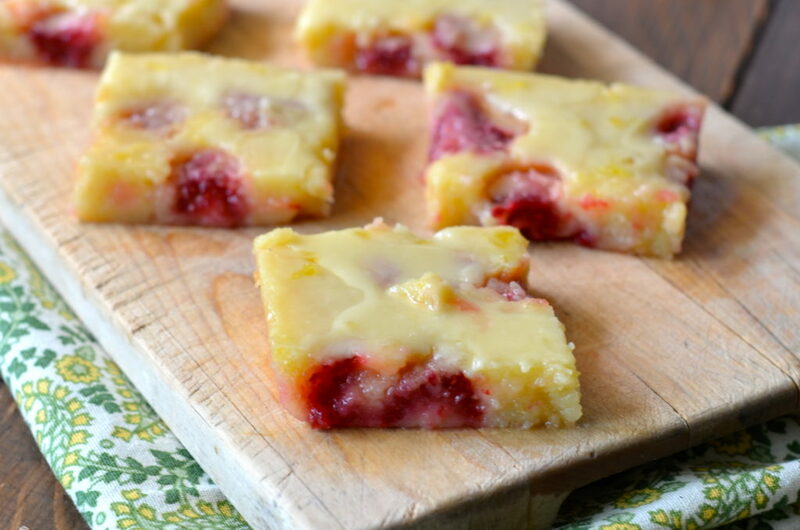 These lemony raspberry treats are so good. I substituted gluten-free flour mix plus 1/2 tsp xanthan gum and they turned out wonderfully. Dovetailing Tip: You will use some of the raspberries for Meal 2 in the Fruit Salsa. Be sure to buy enough! Using a whisk or stand mixer, beat together the butter and sugar until fluffy. Add in the eggs, vanilla extract, and lemon juice and zest. Stir to combine. In a separate bowl, sift together the flour and baking powder. Slowly add the dry mixture into the wet mixture, stirring just till combined. Pat the roughly chopped raspberries as dry as you can with a paper towel, then lightly coat them with a 1/2 tbsp of flour. Gently fold the raspberries into the we mixture. Bake for 23-25 minutes in a 9" x 9" paper parchment-lined baking dish or until a toothpick comes out cleanly. Do not over-bake! They will finish cooking outside the oven. To make the frosting, combine the powdered sugar, vanilla extract, orange juice, and 1 tbsp of lemon juice. Pour over the brownies. Enjoy!